Radial shaft oil seal 16х30х7 TC WLK, Taiwan. Single lip with dust lip and spring. 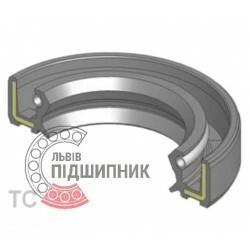 Radial shaft oil seal 11х26х8 SC, Ukraine. Single lip with spring. Net product price: 2,31 грн. Gross product price: 2,77 грн. Radial shaft oil seal 120х146х12 SC. Single lip with spring. Radial shaft oil seal 130х160x15 SC, Ukraine. Single lip with spring. Radial shaft oil seal 160х190x10 SC, Ukraine. Single lip with spring. Radial shaft oil seal 16х30х7 SC, Ukraine. Single lip with spring. Net product price: 1,65 грн. Gross product price: 1,98 грн. Radial shaft oil seal 190х230х15 SC. Single lip with spring. Hurry up! Last items in stock! 51,08 грн. Radial shaft oil seal 24х40х7 SC, Ukraine. Single lip with spring. Radial shaft oil seal 24х40х7 SC. Single lip with spring. Seal is a sealing, used in car rods to hermitize clearances between motion and motionless details. The seal of compaction of the shaft with clamping spring - a basis element of contact compaction device of seal type circular form of elastic material that prevents leakage of work fluid from high pressure area to low, and also carries out security functions of details from dirt and dust falling on them. Usually, oil seals are made of of rubber, polyurethane, plastics, leather. Oil seals are widely used for compaction of the shafts. This type of compaction is simple designed, small sized, good hermeticity, low cost. Work opportunities of the seal are limited in material properties: its temperature range, aging, wear resistance, frittering, chemical resistance. For rubber seals acceptable is temperature mode of the rubber - at low temperatures is possible the loss of flexibility, elasticity and cracking of material of the seal, while at high-temperatures is accelerated aging of seals. At too high speeds of motion detail occur crushing of the seal - thus in a place of collision of the the shaft surface with the seal, it is desirable to provide the lowest roughness. If the shaft is deformed and damaged - this defect will quickly spoil even the most high-quality seal. It should be noted that the highest chemical and heat-proof characteristics of modern technology, achieved in the seals made of fluoroelastomer.